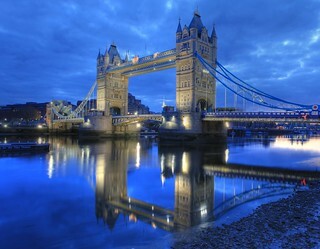 London's Tower Bridge taken from the North Bank of River Thames at the crack of dawn. Most tourists mistakenly call this structure as the London Bridge (which is just next to it). Click All Sizes to see bigger resolution. Looks much better then. Suffering from jet lag after reaching London, I ended up walking 24.4 kilometers (39,000 steps) in a single day, thanks to no transportation after midnight. Later, saw the beautiful sunrise between the pillars of London Bridge. Incidentally, this was the 666th photo on my new camera. Still, neither did the devil appear, nor did I get attacked by the sleeping hobos.